Hello. Welcome to the Open University course "How To Be A Rock Star". 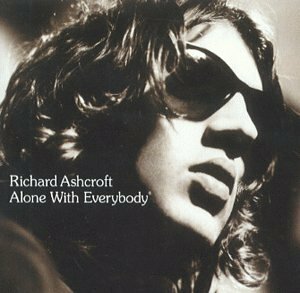 Today, we're looking at going solo and we're joined by Richard Ashcroft. He was the lead singer with The Verve for many years, and he has just released his first solo album. Richard, hi. Richard, what do you think is the most important single factor when going solo? I think the key factor is to show the punters that you're serious about music. Obviously, the only reason that anyone ever goes solo is to get their own way all the time and to get all the money. But you can't admit it, that really dents your credibility. So you have to make it look like you're a perfectionist who won't comprise your musical vision for anyone. So how do you go about showing how serious you are? You show how serious you are by being serious. You gotta look moody and you gotta sound troubled, like that weight sitting on your shoulders is too much. You've got to look moody? Sure, the look and the sound work together. The album cover's critical here, it's going to be the first thing someone sees in the shop and it has to broadcast moody, musical pioneer. Well, I'm aiming for a wide demographic, so we had to go straight down the middle, no fancy stuff. It had to me on the cover, it had to say, "Look, here I am and I'm serious about this". We chose the standard Rock Star pose 15 in black and white. That's taken from slightly below - so you're looking up to me, see the implication? - and I'm looking off to the right - at something hidden to you, yeah? The shades aren't classic Raybans but you can't tell in the photo. That's always been one of my favourite Rock Star poses. What other options were considered? Well, 8 and 10, obviously, but not many really, you have to be so careful. George Michael took a real chance on his first solo album by using his own variant on number 57, and people are still laughing. Definitely one of the industry's cautionary tales, that! What about the back and inner sleeve pictures? You've got to choose a collection of pictures of The Artist at work. Basically, there are two choices: in the studio and on the road, both real classics. We chose in the studio for speed, since we could do it while we were doing the music. Yes, the music. You said earlier that you had to sound troubled to get the requisite amount of seriousness. Obviously, this is important, so what elements did you bring in? Well, you know, don't go overboard. All you need to do is get the public to think you're serious about music. That's not the same as producing good music. It's more important to make it sound serious. You've got to pick your topics carefully, big subjects, eternal truths, that sort of thing. My personal favourite is to bang on about physically big things, like the world, oceans, cities. Then I throw in a few references to shelter, survival, saviours, things beginning with 'S' seem to work well. Oh, and fire, burning, that's always good. Then you repeat the phrases several times, because the more you repeat it, the more importance people attach to it, they think it must be important to you so they take notice. Do you work hard on your lyrics? No, they're crap, but that doesn't matter. Ah, right, is that because the music speaks for itself? Well, look, we've talked about the photographs and how you chose those, we've talked about the right lyrical subjects, but what about the music? Why do you keep going on about the music, man? Look, it's easy. Moody and serious, right? Keep the tempos down, keep the melodies monotonic. Strings are useful here, strummed acoustic guitars, then the slow burn on the distorted guitar. I've always been fond of a wah-wah, too. You make it sound like a formula. Doesn't that make the end product a bit samey? We say "consistency of mood" in the business! It's like when you repeat lyrical phrases, if you keep doing it, people sub-consciously attach more importance to it. But, you know, I've been doing this for a few years now, it's automatic. Let's talk about a few of the songs. "A Song for the Lovers" was the first single, and it's a real epic, isn't it? Those opening strings sound like Prokoviev, then brooding guitar is followed by those purposeful drums. What's it about? I dunno. But those drums, yeah, that's a classic tempo, just a touch over 120, giving you a "moving on" feel without rushing. Clear choice of tempo for the first single, 'cos I'm "moving on" myself, right? We spent a lot of time on that track, the first single has to be right. Are you saying that you didn't spend as much time on the other tracks? Of course we didn't spend much time on them. I think we reused some of the backing tracks from "Urban Hymns". "Lucky Man" is definitely in there a couple of times, under "Brave New World" for sure, and I think we nabbed "The Rolling People" again, I can't remember. You're better off asking Kate, she's better at this stuff than I am. What about "New York"? That's a good, rolling, grungey track, and it seems to be about the realisation of dreams. You've got to make them feel inspired, make them feel like you're giving them something to aim for. Note the tempo again - it's the same as "Lovers", that "getting on with it" beat, the "you can do it" feeling. Make them feel like achievers and they'll love you forever. Is that why you called one of the songs "C'mon People (We're Making It Now)"? Bit obvious, isn't it! I was running out of ideas, to be honest. Richard, before we go, have you got a final word for our students about doing a first solo album? Details matter. For example, if you look closely at the cover of the album, you'll see that the title is followed by a tiny ® symbol. That's there to make it look like I know that it's a zeitgeist-defining statement. Actually, the title means bugger all, but you can see how one tiny detail can give it meaning in the punter's mind. Richard, that's all we've got time for I'm afraid, but it's been a fascinating insight. Thanks very much. Next week we'll be looking at classic comeback strategies and our guest will be Kylie Minogue, who'll be discussing the many varieties she's tried out. Until then, goodbye and keep practising those Rock Star poses. Just so we're clear, I made this up; this is not a real interview with Richard Ashcroft. It's a review of the album Alone With Everybody, and it was written for an online 'zine that a friend of mine ran. I did it like this in part to prevent him from adding editorial comments into the piece, something he was overly fond of. At the time, I gave it 5/10. However, I have to admit that, after writing this review, I continued to listen to the album and I would now give it a higher mark - although I still think my cynicism about his motives and attitude is well placed. (Of course, there is the possibility that he really believes all the guff he writes.) Still, never let truth or feelings get in the way of a good joke! I'm particularly pleased about the line at the end about Kylie's comeback strategies. This was about the same time as she released "Spinning Around" (and over a year before "Can't Get You Out Of My Head", for any of you kids who are up late). At the time it was just another single from someone who'd been trying to emulate early success for some time, although it is now acknowledged as her comeback single. Personally, I've always loved Kylie ... and if anyone has the video for "Put Yourself In My Place", please contact me asap. Finally, for the curious, rock star pose #8 is sitting on a porch with an acoustic guitar, and #10 is standing in some large piece of scenery, usually in snow.